Big data analytics in healthcare is the complex process of examining big data to discover information including hidden patterns, market trends, unknown correlations, and customer preferences, which can help organizations to make informed clinical and business decisions. The field of healthcare analytics is enormous, spanning multiple diverse areas, particularly clinical delivery, operational efficiency, and personalized medicine. In addition, big data analytics optimizes process-oriented expenditures in the healthcare industry by improving the population health, integrating performance modeling with financial and predictive care monitoring, and others. Growth in regulatory compliance in healthcare sector, increase in demand for data analytics solution for population health management, rise in expenditure on technologically advanced solutions by healthcare providers, and continuous growth in enormous amount of medical data generation in form of electronic health record (EHR), biometric data, sensors data boost the growth of the global big data analytics in healthcare market. The global big data analytics in healthcare market size was valued at $16.87 billion in 2017, and is projected to reach $67.82 billion by 2025, growing at a CAGR of 19.1% from 2018 to 2025. North America region dominated the overall big data analytics in healthcare market share in 2017, due to rise in advancements in IoT and increase in the demand for analytical models on patient information for better service delivery, government policies. The report focuses on the growth prospects, restraints, and big data analytics in healthcare market trends. The study provides Porter’s five forces analysis of the big data analytics in healthcare industry to understand the impact of various factors such as bargaining power of suppliers, competitive intensity of competitors, threat of new entrants, threat of substitutes, and bargaining power of buyers on the big data analytics in healthcare market growth. The global big data analytics in healthcare market is segmented based on component, deployment, analytics type, application, end user, and region. In terms of component, the market is bifurcated into software and services. On the basis of deployment, it is fragmented into on-premise and cloud. Depending on analytics type, it is segregated into descriptive analytics, predictive analytics, prescriptive analytics, and diagnostic analytics. By application, it is classified into clinical analytics, financial analytics, and operational analytics. By end user segment, it is divided into hospitals & clinics, finance & insurance agencies, and research organizations. Region wise, it is analyzed across North America, Europe, Asia-Pacific, and LAMEA. The key players operating in the global big data analytics in healthcare market analysis include All Scripts, Cerner, Dell EMC, Epic System Corporation, GE Healthcare, Hewlett Packard Enterprise (HPE), International Business Machines (IBM) Corporation, Microsoft, Optum, and Oracle Corporation. Increase in the demand for analytics solutions for population health management and rise in need for business intelligence to optimize health administration and strategy are expected to drive the market growth. In addition, growing inclination toward cloud-based analytics solutions in the market is expected to provide lucrative opportunities for the market expansion. Population health management demands for complete patient care with cost-effective medication processes, thereby requiring integration of clinical and claims data on the same platform for data analysis. Surge in the demand for improvement in care management, prediction of early illness factors, and hospitalization process is anticipated to fuel the growth of the global big data analytics in healthcare market in the future. Moreover, citizen health is of prime importance for healthcare administration in the healthcare industry, which in turn requires predictive analysis of population health and is expected to augment the implementation of big data analytics during the forecast period. Various developed nations including the US, the UK, Brazil, Germany, Sweden, Canada, France, and many others focus on big data implementation for healthcare analytics to provide best treatment procedures and clinical services. With an objective for better treatment with reduced costs, several government departments and healthcare agencies are focused on technological implementation for predictive modeling on healthcare and clinical data. In the recent past, organizations from healthcare sectors are realizing the benefits of cloud solutions and preferring using cloud analytics tools over conventional on-premise BI (business intelligence) solutions. Enhanced planning, insightful decision-making, and predictive analysis have become mainstream requirements among business leaders, owing to the growing need for client and customer management. According to the Harvard Business Study on cloud business analytics, industry players are more focused on deploying cloud-based data discovery & visualization, predictive analytics, big data, and mobile analytics solutions. These factors are anticipated to create lucrative opportunities for the analytics providers during the big data analytics in healthcare market forecast period. This study presents the analytical depiction of the global big data analytics in healthcare market along with the current trends and future estimations to determine the imminent investment pockets. The report presents information related to key drivers, restraints, and big data analytics in the healthcare market opportunities. Porter’s five forces analysis illustrates the potency of buyers & suppliers in the global big data analytics in healthcare market. 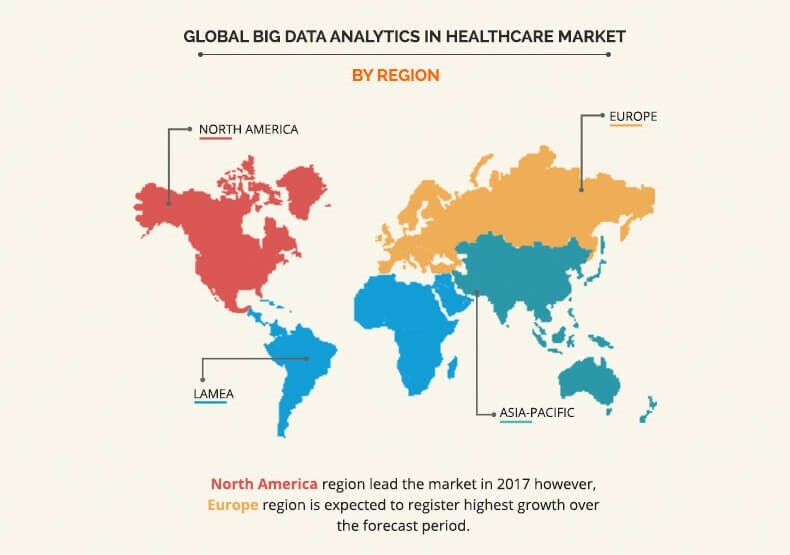 The global big data analytics in healthcare market is projected to witness significant growth, especially in North America and Europe due to increase in adoption of big data analytics and rise in need for business intelligence in the healthcare industry across these regions. The big data analytics in healthcare market is projected to grow at a CAGR of 19.1% from 2018 to 2025, owing to increase in regulatory compliance and rise in need for business intelligence to optimize health administration. Big data analytics in healthcare market in several European and Asia-Pacific countries, including Finland, Sweden, China, Japan, and many others, possess high market potential due to strong government support and increase in cloud adoption among the end users. Though vendors operating across the big data analytics in healthcare market are concentrating on bringing interoperability and better health information technology through big data analytics to hospitals and health systems, their customers are still focusing mostly on securing the sensitive health data, ensuring patient safety and improving operational efficiencies. Furthermore, growth in awareness about adopting population health management and clinical analytics is boosting the growth of this market. The key players profiled in the big data analytics in healthcare market report include All Scripts, Cerner, Dell EMC, Epic System Corporation, GE Healthcare, Hewlett Packard Enterprise (HPE), International Business Machines (IBM) Corporation, Microsoft, Optum, Oracle Corporation. These players have adopted various strategies such as merger & acquisition or strategic alliance with start-ups and well-established players to expand their market presence and enhance their product portfolio. "Big Data Analytics in Healthcare Market"